Love creating unique designs on fabric but hate heat-setting? Then Speedball’s Fabric Block Printing Inks are for you! Made from a water-washable oil, these inks print with bold, opaque color and maintain a soft hand. Available in 14 colors and a transparent base in 2.5oz. (75ml) tubes. All colors carry the AP Seal and clean up easily with soap and water. Looking for some creative inspiration on how to use Speedball’s Fabric Screen Printing Inks? Select from the links below to see finished project images or view step-by-step instructional videos. On what fabrics can I print using Speedball’s Fabric Block Printing Inks? Smooth fabrics that do not possess a heavy texture or stretch are best for use with Speedball’s Fabric Block Printing Inks. Cotton, Linen, Broadcloth & Denim are examples of ideal fabrics for use. Nylon and canvas are not recommended for use with Speedball’s Fabric Block Printing Inks. How long do Speedball’s Fabric Block Printing Inks take to dry on fabric? Speedball’s Fabric Block Printing Inks will dry to the touch overnight. How long do I have to wait for Speedball’s Fabric Block Printing Inks to become permanent on fabric? Depending on your climate, we recommend waiting 4-7 days before washing your fabrics after printing with Speedball’s Fabric Block Printing Inks. What does water-washable oil mean? While formulated to possess the working properties of oil-based inks (permanence, tack, etc. ), Speedball’s Fabric Block Printing Inks are easily cleaned up with soap and water. What is the open time for Speedball’s Fabric Block Printing Inks? Speedball’s Fabric Block Printing Inks have an open time that is similar to that of Water-Soluble Block Printing Inks. What modifiers are available for use with Speedball’s Fabric Block-Printing Inks? Speedball’s Fabric Block Printing Transparent Extender is available to create transparent color while maintaining viscosity. 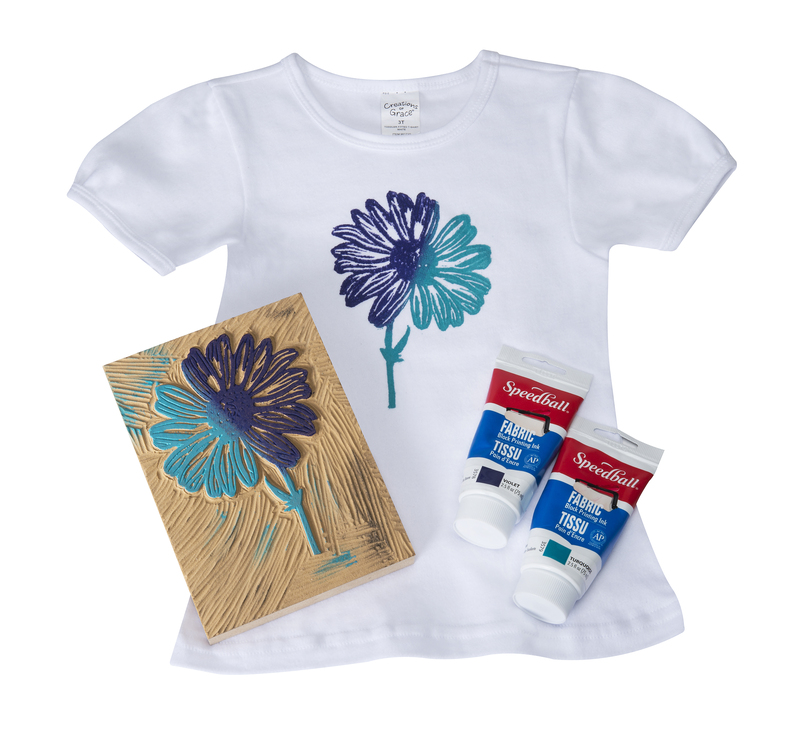 What surfaces can I use with Speedball’s Fabric Block Printing Inks? Speedball’s Fabric Block Printing Inks are ideal for printing with linoleum, wood or soft block surfaces. What brayers are recommended for use with Speedball’s Fabric Block Printing Inks? Soft Rubber Brayers are ideally-suited for use with Speedball’s Fabric Block Printing Inks.